Hello there! Today I'm sharing a couple of cards featuring the fabulous Echo Park Coffee Time stamp set! This stamp set is just the cutest! I love the mix of coffee and flowers in the set! My first card uses just one of the sentiments available in the set... "Coffee makes everything possible." Oh, yeah! I love it! I paired the sentiment up with some of the fun Echo Park Coffee papers and a cool Paper House 3D Coffee Talk Sticker. A pretty simple card with fun layers! My second card uses more of the stamps... I stamped the flowers a few times along the edge and then filled in some of the space with the cute mugs and the heart. I used the following Copic markers to color in the flowers ~ YG93, YG95, YG97, R00, R01, R05, R11, R12, R21, BV000, BV04. I stamped the sentiment using Versamark watermark ink and then heat embossed a fine white embossing powder. I trimmed it down to a banner and popped it up on the card. I love the simplicity of this card. The copics bled through just a tiny bit since I didn't do a lot of blending so I'll just cover the inside of the card with a slightly smaller layer of white card stock, but this step isn't totally necessary. I think it comes down to preference and maybe who the recipient is going to be. Have you been loving all the coffee inspiration this month?! I am having a ball checking out all the fantastic posts from the design team this month! It's no secret that I love my coffee! Keep checking in to see more coffee inspiration! Before you leave though... I am having a little giveaway! 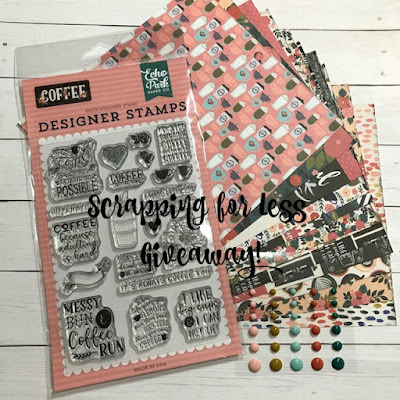 I have this brand new stamp set to giveaway plus some other goodies from my stash that I've thrown in. All you have to do to enter is to comment on my blog. AND for a bonus entry, I'm also sharing this giveaway on my Instagram. You can head over there, like my post, and follow me and you'll have another chance to win!! AND for another bonus entry, follow the Scrapping for Less Instagram. You have until 1/17/2019 midnight EST to enter. Unfortunately, open to US residents only. I will announce the winner on my Instagram on 1/19/2019!! Wow...what a nice giveaway! Very cute cards! Of course, you had to have a 3d coffeepot sticker. What fantastic cards! The coffee pot sticker is too cool and I love the colors and layout of the floral card. I've had my eye on this collection for some time now. I would love to add to my collection. Your cards are a great inspiration as always. OMG! These are soooo much fun! I love the mugs along the flowers and the PERFECT sentiment! Thanks for the chance to win the amazing coffee goodies! Oh my gosh, Crystal, our cards are fantastic! I love the papers and stamp set. These were definitely added to my wish list. 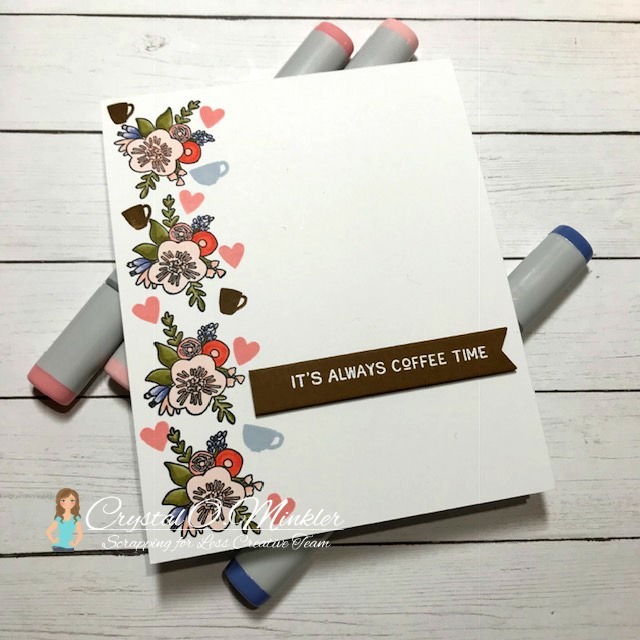 Can you believe that I'm a coffee lover and don't have a coffee stamp set yet?!! I've been following and enjoying all the creative coffee posts this month. Thanks for the inspiration and thank you for the chance at such an amazing giveaway!! 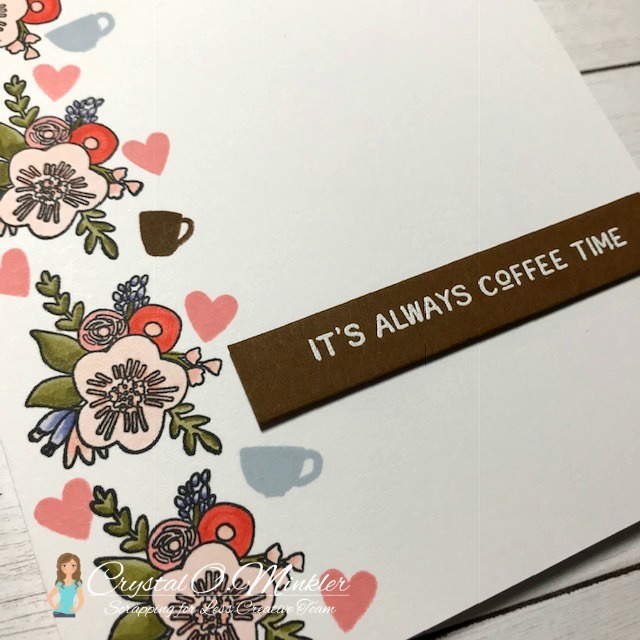 I am new to stamping and a new Banana Split subscriber.I love coffee themed cards! They never go out of style. A chance at a fun giveaway never goes out of style either! I'm excited!Thank you Crystal!! 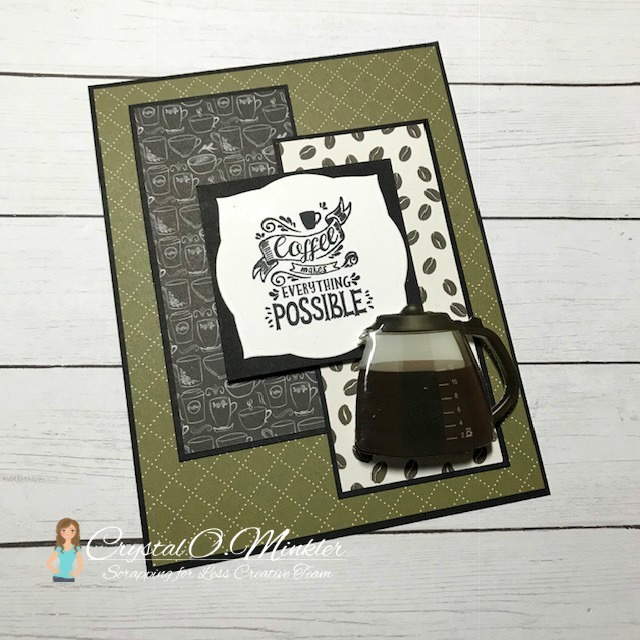 Wonderful coffee cards! Great theme to get us all perked up for the year! Nice cards! I live scrapbookingforless! I’ve ordered a few times and always happy with what I got and now they are carrying dies! I love coffee cards. You did a really nice job coordinating your patterned paper with the 3D coffee pot sticker. Very cute! Love coffee cards! Awesome give away as well. Love both of these! That sticker! Looks so real...lol! And love your beautiful border... love!! And thanks so much for stopping by my place too! Fab palettes on these lovely cards and thanks for all the inspiration. 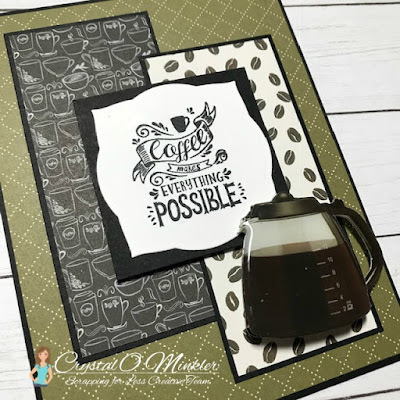 Wonderful coffee themed cards and great giveaway. I am waterlily57 on IG. Cute projects. Thanks for the chance. Thanks for a chance at your great giveaway! Love your card!